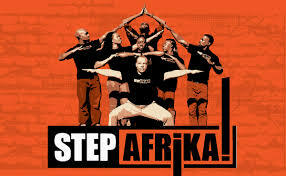 Step Afrika blends percussive dance styles practiced by historically African American fraternities and sororities, African traditional dance and influences from a variety of other dance and art forms. Performances are much more than dance shows; they integrate songs, storytelling, humor, and audience participation. The blend of technique, agility, and pure energy makes each performance unique and leaves the audience with their hearts pounding.